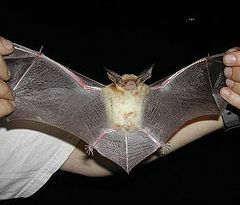 Pallid bat is a large and light colored bat species which is native to the western United States. This is the only species of Antrozous genus that is closely associated with Van Gelder’s Bat, which is, at times, listed in Antrozous. 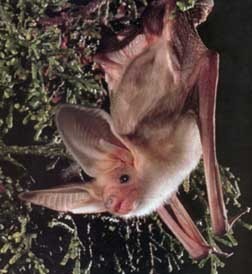 An adult Pallid bat can be about 90 – 130 mm in length and weigh around 10 – 17 grams. The size of their eyes is slightly bigger compared to other North American bat species. The color of their fur varies from yellowish brown, light brown to cream having white fur on their belly. They have relatively large ears which is about 2.5 cm long as compared to their head. 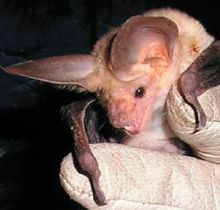 Pallid bat can be found in arid and semi arid regions of the western part of the United States. They occur from the British Colombia and Montana towards central Mexico. Eastwards, their range goes up to Oklahoma, Texas and Kansas. Few isolated colonies of this species can also be found in western Canada and Cuba. Pallid bats are primarily found near deserts. They love to inhabit dark and undisturbed rocky outcrops. They choose a roosting site depending on the availability of food nearby. They can be spotted roosting in hallow trees, mines, caves and buildings. During hot weather, they have been spotted to move to the cooler and deeper area to maintain their body temperature. This species do not migrate long distances during change in seasons. They divide into small groups and hibernate in deep caves or in a tree hole where the temperature is constant. Pallid bats prey on various kinds of animals, which include centipedes, scorpions, cicadas, crickets, long-horned beetles, ground beetles, praying mantis and grasshoppers. They are also known to feed on small rodents and lizards. This mammal is a highly social species. A single group of Pallid bats may range from 10 – 100 bats. In 90% cases a single group consists of 20 individuals. Compared to other bat species, Pallid bats come out late to hunt from their hiding places. They are very good in climbing and crawling. Compared to other small bat species, this bat is not very good in performing flying maneuvers. They catch most of their prey on the ground. Occasionally, they have been spotted to do aerial hunting. Pallid bat reaches their sexual maturity in a year or so. Breeding starts from October and continues throughout the winter. The gestation period may last around 55 – 73 days; after which 1-3 offspring are born during May – June. Pallid Bats give birth to an average of 2 offspring at a time and around 20% of the time a single offspring is born. The newborns weigh around six grams at the time of birth, having closed eyes and folded ears with little visible hair on the body. Female lactate them for 2 – 3 months. Young ones can open their eyes within five days from birth. They start flying within 4 – 5 weeks from birth. In the wild, this species can live for about 9 years. But in captivity, individuals have survived for more than 11 years. The species is susceptible to ground dwelling predators such as snakes, fox, raccoon, frogs, cats, owls, coyotes etc, as these bats themselves catch most of their prey on the ground. Female Pallid bat do not raise newborns of other females. 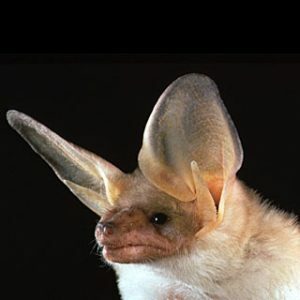 As they have large ears; Pallid bats can easily detect the footsteps of their prey on the ground. On the ground, Pallid bats perform various kinds of strides and gaits. This species can stay for long periods without drinking. This bat species can fly at a level of around 20 – 90 cm above the ground. They have various kinds of communication calls; most of these calls are not audible to humans. In some regions, they play an important role from ecological and economic point of view as they consume various kinds of crop pests. Pallid bat is quite common in its native range. This species is counted among least concerned species in the list of International Union for Conservation of Nature (IUCN). But disturbances caused by humans near their roosting areas are an increasing concern for the survival this species in future.